Other Common Names: Compass plant, compass weed, incensier, dew of the sea, polar plant, romero (Spanish), mi-tieh-hsiang (Chinese), rosmarin (Swedish). 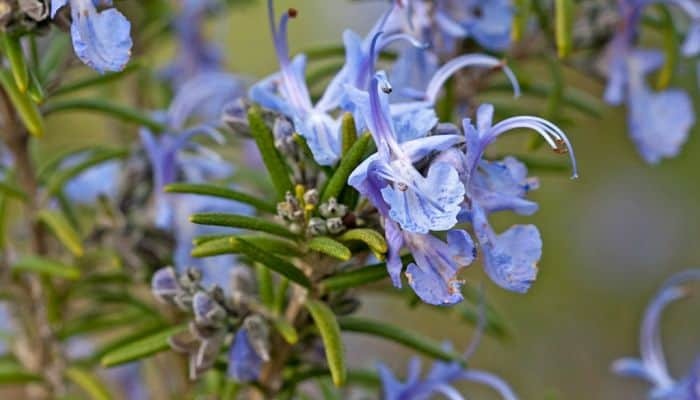 Habitat: Rosemary is native to the Mediterranean countries, but is now grown worldwide as a spice and medicinal herb. The plant thrives best in a warm sunny climate. Description: Rosemary is an evergreen shrub like plant that belongs to the mint family (Lamiaceae). It can grow up to 2 meters (6 feet) high and the flowers are petite and pale blue that appear in slight clusters up the stems. The leaves are slender and look a lot like curved pine needles. They are green on top and gray beneath. The dried herb is brownish green in color. Plant Parts Used: Leaves, flowers, stems, branches. Commercially, the entire plant is used. An essential oil is extracted from the leaves and flowers by steam distillation. The leaves contain 1-2.5% essential oil flavonoids (luteolin, apigenin, diosmetin), tannins and saponins. Additionally, the plant is very high in iron, calcium, and Vitamin B6. 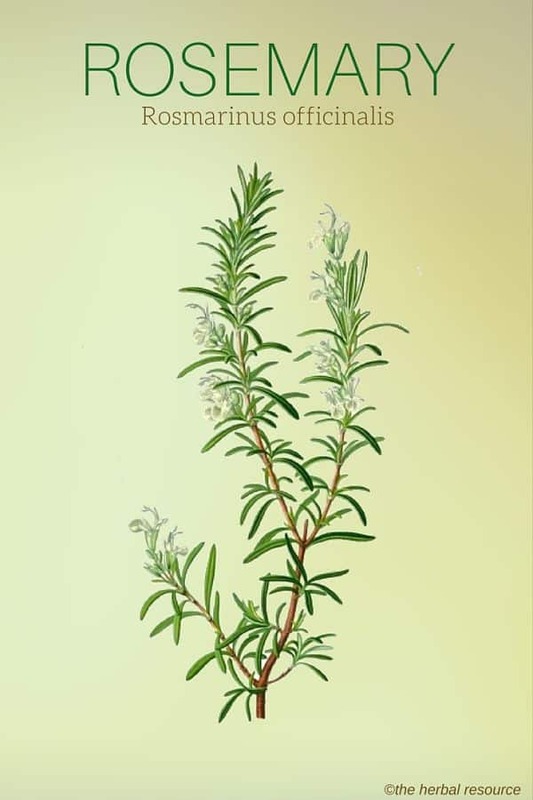 Rosemary has long been thought to prevent premature balding and even aiding new hair growth. It has been infused into many shampoo products as an aid in fighting dandruff. This herb has been used as an insect repellant and is commonly placed in closets and dressers to keep moths away. Additionally it has been used to get rid of head lice. 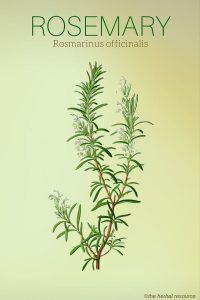 Rosemary has had a long-lived reputation for improving memory. Some studies claim that the carnosic acid found in rosemary may shield the brain from free radicals. Lowering the risk of strokes and neurodegenerative diseases like Alzheimer’s disease, dementia and Lou Gehrig’s disease. It is believed to be helpful in the digestion of starchy foods and vegetables to avoid indigestion. Rosemary is also believed to relieve flatulence and it is commonly used as a circulatory and heart stimulant. 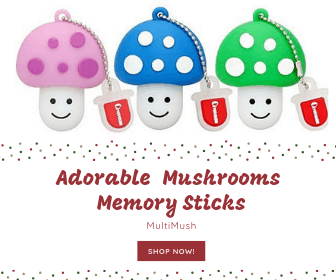 In addition, it has been shown to have possible antioxidant properties. Muscle and joint pain and the symptoms of gout have been relieved throughout history with this herb. Rosemary oil is sometimes used to treat muscle pain and arthritis. 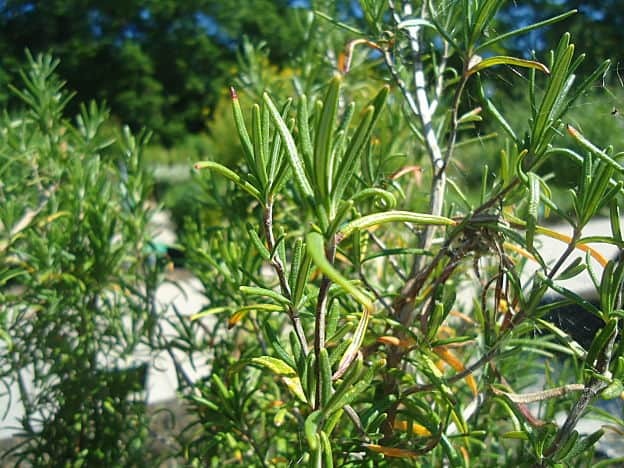 Rosemary is used as incense and is also very common in aromatherapy. The herb is approved as a medicinal herb by the German Commission E.
Fresh and dried leaves are often used in traditional Mediterranean cuisine. As a tea: Steep 6 g of dried herb in 2 cups boiling water divide into 3 portions. This may be consumed throughout one day. Adults should not exceed 6 grams of rosemary internally per day. For the bath: Place 50 grams of dried rosemary in 1-liter water, boil, then let stand for 30 minutes. Add to bath water. Essential oil: (6-10%) Mix two drops with one tablespoon of base oil. Do not ingest internally, do not apply to an open sore, and avoid eye contact. Some people may have an allergic reaction to the oil. Tincture (1:5): 2 – 4 ml three times per day. As with any medication read labels carefully, take only as directed and never under any circumstances should you ever exceed the recommended dosages. As with any medicinal herbs or medications, you should always consult with your healthcare provider when using rosemary. Be sure to consult with your pharmacist when taking this herb with any other prescribed medications. It is not recommended that you use rosemary in children under 18 years of age. Rosemary should not be taken by people with high blood pressure, ulcers, Crohn’s disease, or ulcerative colitis. The oil can be toxic if ingested, and should never be taken orally. The herb may affect the blood’s ability to clot and could interfere with any blood-thinning drugs you are taking. Be sure to consult your doctor if you are taking Plavix, Coumadin, or Aspirin or any other type of blood thinner. Rosemary may interfere with the action of ACE inhibitors in high blood pressure medications like Monopril, Vasotec, Zestril, Capoten or any other such medications. It may alter blood sugar levels and could interfere with any drugs taken to control diabetes. Blumenthal, Mark: Herbal Medicine. Expanded Commission E. Monographs. Austin, Texas, American Botanical Council. 2000. Duke, James A.: The Green Pharmacy Herbal Handbook. Rodale / Reach. 2000. Fetrow, Charles W. & Juan R. Avila: Professional’s Handbook of Complementary & Alternative Medicine. Springhouse, Pennsylavania, Springhouse Corporation. 1999. Mindell, Earl: Earl Mindell’s Herb Bible. New York, Simon & Schuster / Fireside. 1992. I have used rosemary for allergy for many years and it works for me. I normally mix it with aloe juice.